I closed the year 2013 on a quiet note, detailing the white house at St. Williams. The main roof has the kit chimney, plus two vents for the plumbing stacks for the kitchen and bathroom. These were bent from brass wire and glued into holes drilled in the roof, then painted. Some weathering powders on the roof add a touch of rust below each pipe, and a touch of moss on the side sheltered by the tree. The oil tank is kit 2104 from TractorFab. It’s a very nice laser cut kit that took about a half-hour to build. I’m not actually sure what it’s doing on this house – it wouldn’t be furnace oil because that would never flow in the winter from an outdoor, uninsulated tank like this. (Maybe that’s what the confab on the porch is about?) But it looks good, so there it is. The electric meter is detail part S5024 from Wiseman Model Services. I added a taller stack made from wire. When I plant this house permanently, I’ll run the power line from this stack to the utility pole across the road. 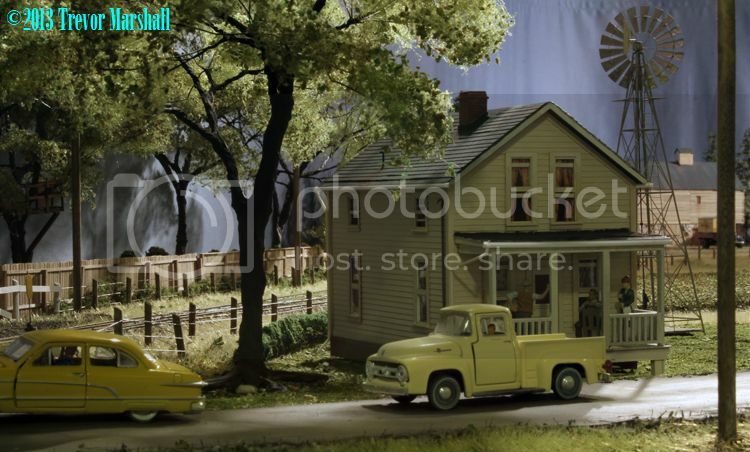 Planting the house on the layout will require building up the ground underneath it, adding a sidewalk to the roadway, adding a driveway next to the house on the side with the oil tank, and some landscaping to blend the house into its environment. Last night I shingled the roof on the house for St. Williams. 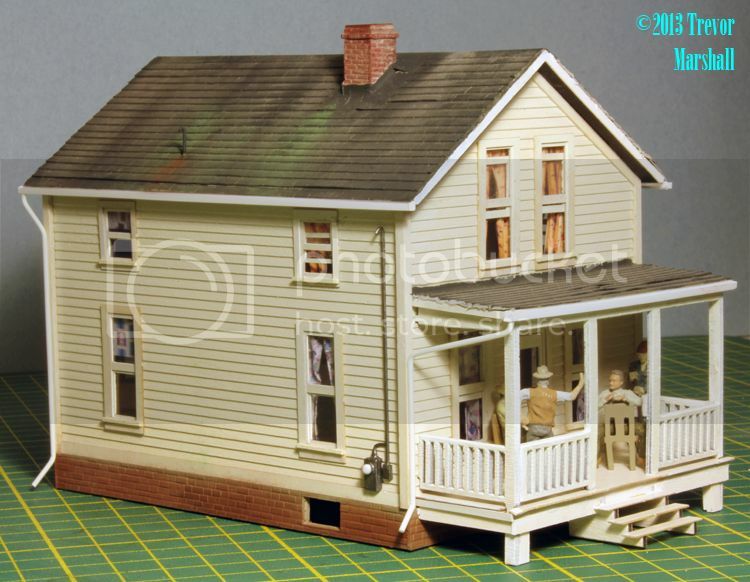 The kit included laser cut paper shingles in pale grey. I decided to use these, but will paint them black. First, as I lay each row I run a bead of CA along the top edge of the strip. Then, when I have finished the roof, I carefully brush a coating of dilute Weld-Bond (2:1 adhesive to water) over the shingles. When this dries – usually overnight – the roof is nice and solid. 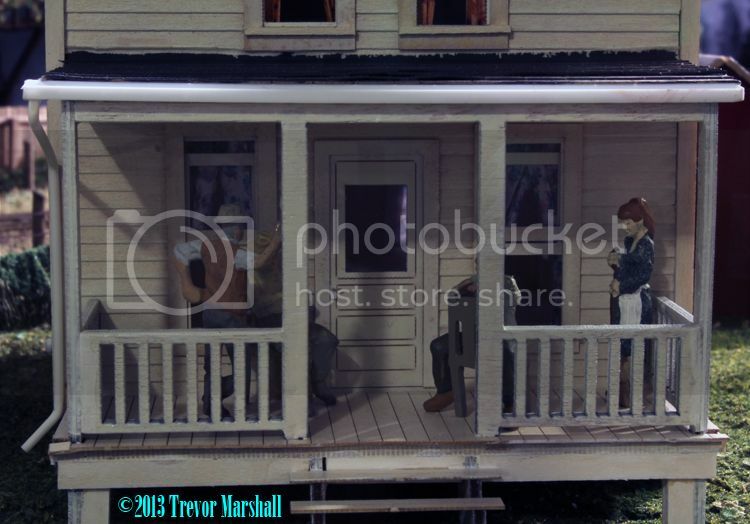 Next up – painting the roof, adding the stairs, and detailing. I’ve made considerable progress on the house for St. Williams. As the lead photo shows, I’ve built and installed the windows and doors, including curtains and glazing with real glass. I made no attempt to model a full, detailed interior: The goal was to allow the curious to see light through appropriate windows – for example, if one looks across the front bedroom one can see light from the window on the far side. I started by cutting two floors from styrene, notched to fit around the interior wall braces. 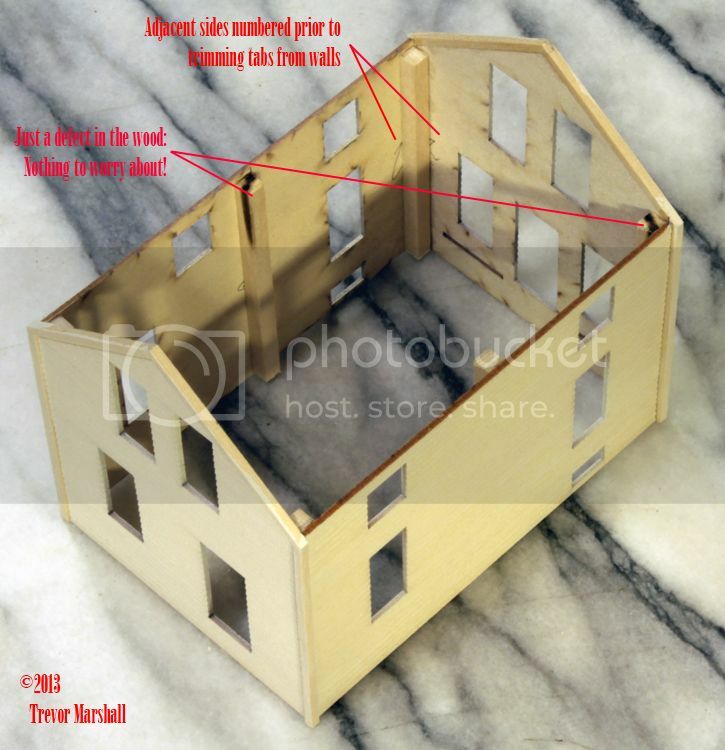 I glued the ground floor in place, then added interior walls following the diagram in the kit instructions. The ground floor includes an L-shaped living/dining room, a kitchen, and an L-shaped staircase. I cut two wall sections from styrene to form the interior walls for the kitchen and glued them in place. Next, I glued the upstairs floor in place on top of the kitchen walls. 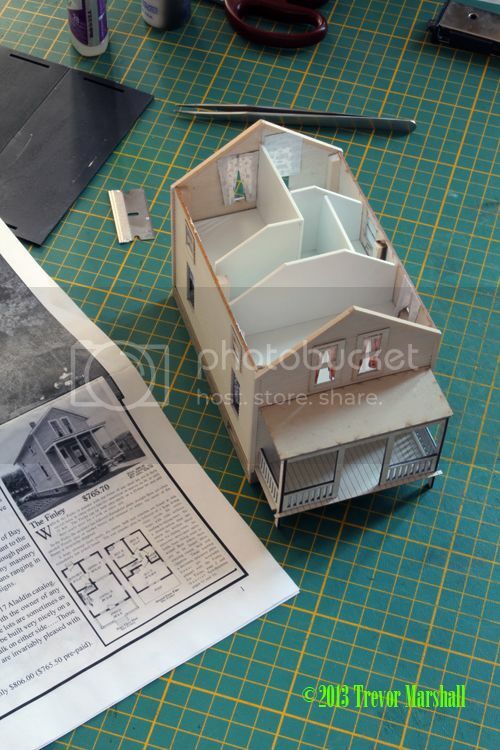 Then I divided the upstairs with more styrene walls, as shown in the above photo. I didn’t worry about making these walls exactly match the pitch of the end walls – in fact, they don’t even rise to the peak of the roof. This won’t be seen when the roof is in place. Instead, I cut them so they would not interfere with the roof and glued them in place. The master bedroom runs across the front of the house. Behind that is a an L-shaped space representing the stairwell and hallway. A single bathroom is to the right, behind the master bedroom, while two smaller bedrooms share the back of the house. With the walls in place upstairs, I added curtains to the bedroom windows. For curtains, I went online and found some 1950s curtain patterns. 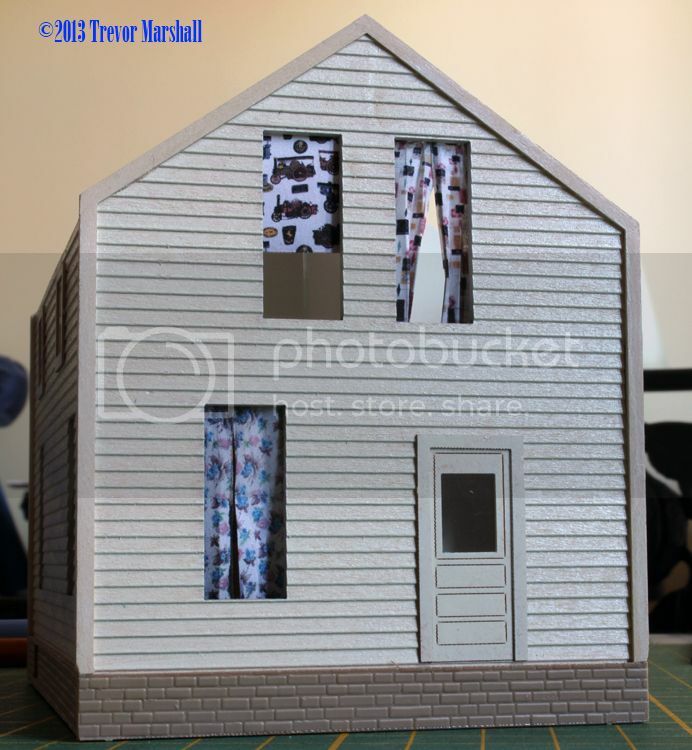 I saved the images, imported them into a Microsoft Word document, and resized them so they were 1.25 inches tall – big enough to cover the windows. I duplicated the images so I’d have enough of each type of curtain to do each room, then printed out a sheet of curtains on a colour printer. Easy-peasy. I cut out each curtain, then folded it accordion-style, in very tight folds. I then smoothed out the top of each curtain, added a bit of CA, and glued the paper curtain in place behind the appropriate window opening. For some rooms, I used the printed material flat, to represent a roller blind. 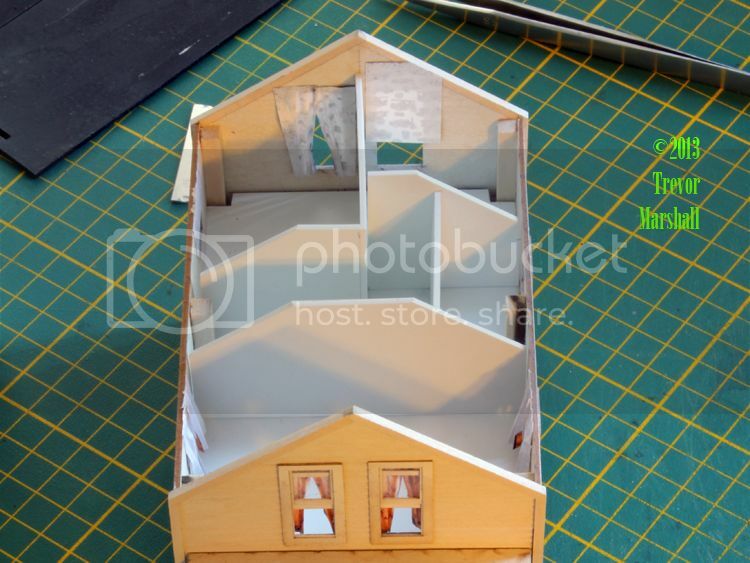 While curtains and blinds might not be printed on the back side – the side facing the outside world – I think doing this on the model adds some nice colour and looks better than plain white paper. Others may prefer to simply cut material from printer paper and not bother with printing out appropriately scaled patterns. With floors, interior walls, and curtains in place, I then turned my attention to the windows. The kit windows are built up from three layers of laser cut wood, complete with peel’n’stick backings. These are, the outside frame, a two-light interior frame that represents the upper (fixed) sash, and a single-light interior frame that represents the lower (movable) sash. The instructions do not mention that the outer frames and two-light interior frames have a top and bottom – so I’ll mention it here. I goofed on a couple of windows before I realized this and hand to peel them apart to rebuild them. The outer frame should be positioned so that the wider piece is at the bottom. The two-light interior frame has one opening that’s larger than the other – this is the lower of the two lights. The instructions would also have one start on the innermost frame and work one’s way out. This is backwards: It’s a whole lot easier to start with the outer frame and work in, especially if one is using real glass as I did. Peel the backing away from the outer frame, and lay the two-light interior frame in place. Peel the backing away and add glass to the upper window. Then add the single-light interior frame – either fully closed or positioned partially- or fully-open. (I left a number of windows open, since I’m modelling August.) Then peel the backing off the lower sash and add the glass. Finally, position and press the completed window into place. To model open windows, the lower sash will not have enough contact with the adhesive on the two-light frame. Secure the lower sash in place by holding it in the desired position and using a toothpick to add a line of Microscale’s Kristal Klear to each side of the sash. Do not use CA, which will fog the glass. This high-tack adhesive will not do that, but will hold the sash in place. 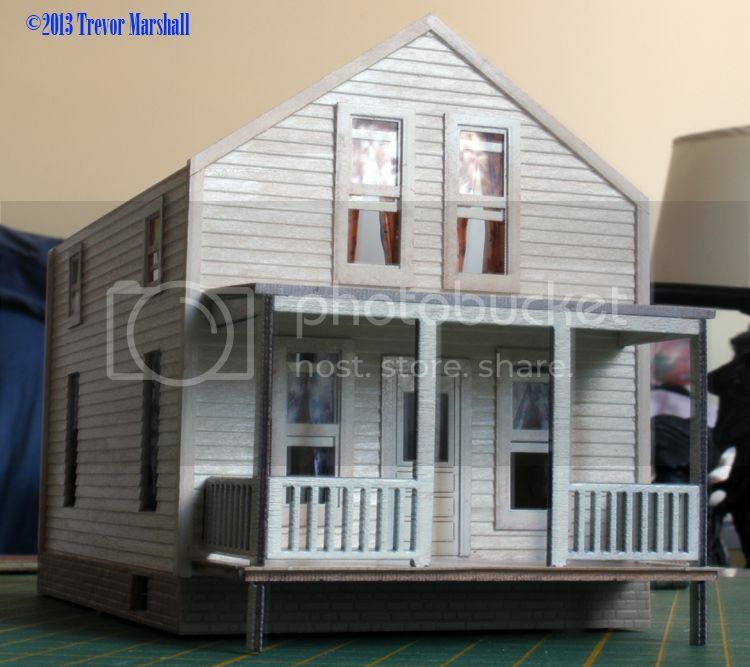 As the photos show, I’ve also added the foundation and the porch – although I need to finish painting some edges. There’s more to do, including shingling the roof – but the house is very close to being finished. It’s going to look really nice across from the station in St. Williams! I had a reader ask about my technique for using real glass for windows – noting that it’s very easy to break the microscope slide covers when cutting them to size. I wrote about using real glass in the January, 2009 issue of Railroad Model Craftsman magazine – still available from the publisher. But here are some ideas to guide others who are breaking a lot of glass. 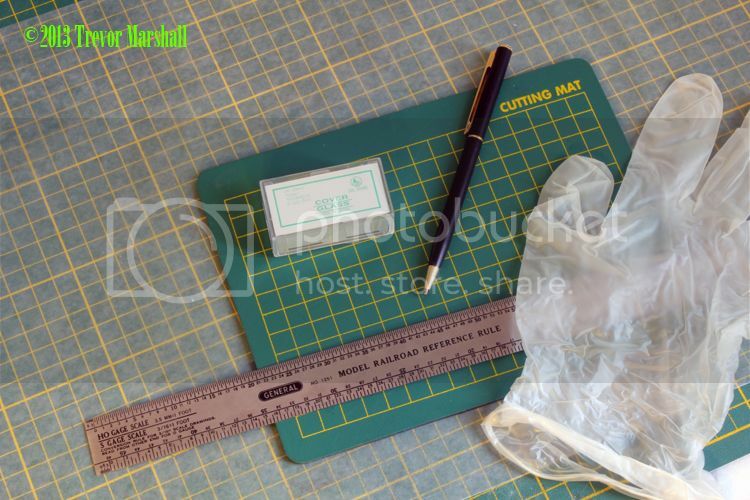 I have a small cutting mat that I use only for cutting glass. I keep it in a drawer when I’m not using it so it stays clean and dust-free. Under the mat, I have a second, larger mat – which I use for all sorts of modelling projects. Between the two, I put a piece of waxed paper, so I can clear glass shards off the small mat onto the paper, then when I’m done working on glass I can fold the paper so that I keep any shards contained before disposal. The mat is important because it supports the glass with just the right amount of give so that one can score the slide covers without breaking them. The black “pen” is actually a diamond-tipped scriber. I bought this at a jewelry supply company, and it set me back about $20. I use it only for glass and it does a terrific job – scoring the glass with very little pressure. The steel rule is used for measuring the sizes I need to cut, and for guiding the scriber. The rubber gloves are essential to cutting glass. In fact, I use them when airbrushing as well, so I buy a box of them from my local Lee Valley Tools. The gloves do more than keep finger prints off the glass: They allow you to handle the glass with confidence – and this means you don’t end up breaking it because you’re worried about putting prints on it, instead of worrying about how much pressure you’re using to hold things in place. I can’t do decent glass work unless I can clearly see the glass. And this stuff can disappear on a surface without a strong, directional light. With the glass marked, I can then line up the ruler with the two marks – holding the ruler down with fingers placed to either side of the glass itself – and then I lightly draw a line with the scriber. I let the diamond do the work: That’s what I paid the $20 for. It took a bit of practice to get a feel for just how much – or rather, how little – pressure I needed to use. The scriber may break the glass along the line when I scribe it, or it may not. 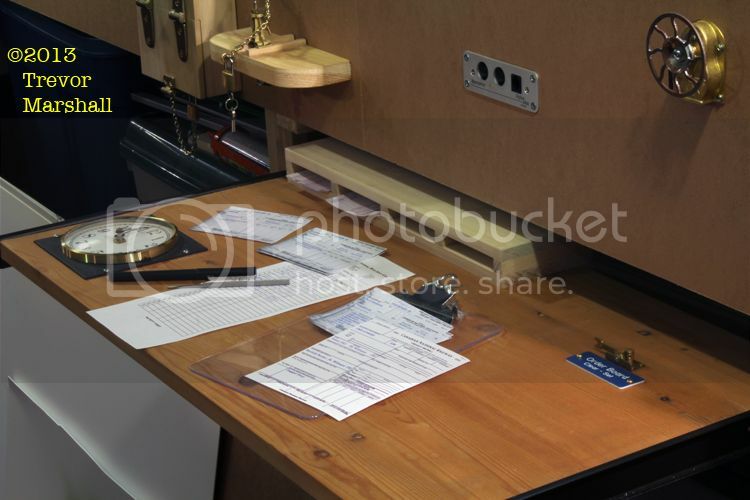 I can repeat scribing the line until it does break – or I can slide the glass to the edge of the cutting mat and press down on the scrap piece to snap the glass along the scribed line. Regardless, I tip and tap my glass cutting mat onto the waxed paper to collect the scrap and then move onto the next cut. I’ve been contacted by a woman named Penny Plunkett who is working on a history of Forestville – one of the intermediate stops on the Port Rowan branch. Penny is looking for information – in particular, photographs – of the Forestville depot. If you have any – or know of any sources for these – can you let me know via the comments to this post? I can then pass along the information. I was afraid someone would ask… although I’m also glad that Ralph Heiss did. Ralph runs the LCL Ops Modeling Yahoo Group, which has a lot of great info about less than carload operations and how to model them, so he’s keenly interested in the issue. I found the group after publishing a blog post about representing LCL on the layout – or, at least, my first steps towards doing so. As the post notes, I’ve created freight receipts to represent Express and LCL. Ralph, to answer your question: I’ve been testing various ways to use this information on the layout but so far I have not settled on a system I like. The primary way in which LCL will affect operations is the time required to load and unload it at stations. On my layout, this isn’t really an issue at Port Rowan, providing the train is spotted at the station while carload switching is performed. 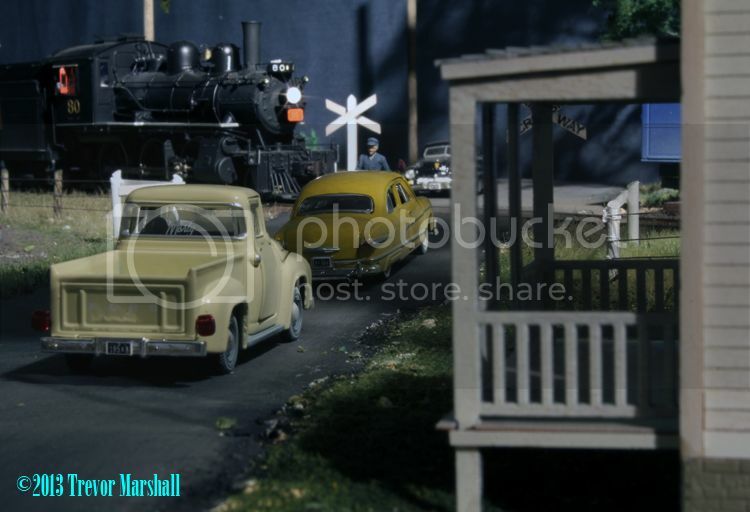 Even the time it takes for the crew to run their locomotive from the station to the turntable and back should be sufficient in most cases to transfer LCL and express, since the platform at Port Rowan is long enough to accommodate the whole train. This means I need some way to translate the freight receipts into the amount of time the train must stop at St. Williams with the appropriate car (LCL boxcar or the baggage section of the combine) spotted at the platform. I have a fast clock system, which helps with this. On the real railroad, the work would simply take place until it was done. Time isn’t an issue – it takes what it takes. 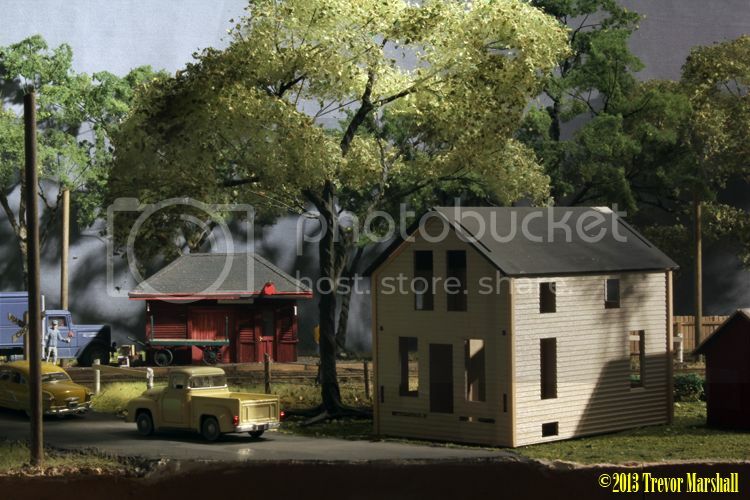 But on a layout, we aren’t physically moving the freight so we need a way to represent the time it takes. * The car must be spotted for a set amount of time for each package listed on the freight receipts. * The car must be spotted for a set amount of time for each 10 pounds of freight listed on the receipts. Using the fast clock, the conductor can note the time that the car is spotted at the station, then calculate how much time will be required to transfer Express and LCL on and off the train. * First, there’s the math. Nobody really likes doing math. * Second, regardless of whether it’s calculated by weight or by number of items, the time can quickly add up to a lot of standing around for the operators – which, frankly, isn’t very fun. Changing the amount of time per unit of measurement – for example, from 30 fast-seconds to 15 fast-seconds per 10 pounds – is one way to address the second problem. Breaking the work into unloading on M233’s trip west to Port Rowan, and loading on M238’s return trip east, also helps reduce the apparent wait time by splitting it. But neither solution does nothing about the first problem: The math. One option I’m considering is adding a timer next to each fast clock on the work desk. If they’re mechanical timers, I can add some new faces – either marked in fast minutes or in number of packages. Some math would still be required to figure out how long each car must be spotted at the platform. But once that’s figured out, one could simply set the timer and do other things until it dings. Nothing is decided yet and I’ll continue to work on this. Thanks again for asking the question, Ralph – stay tuned for more! As the above photo shows, I’ve added bracing in the four corners as well as a couple of pieces along the two long sides. I cut pieces from strip wood – the size is not important except that it should be fairly large since it’s structural. After adding the trim, but before gluing the four walls together to form the structure, I added the large strip wood braces to the inside of the two end walls. I lined this up on the joint between the laser cut wall and the 6″ x 6″ corner trim. Meantime, I measured and drew a vertical line on the inside of the two side walls to locate the mid-wall braces. Their exact location isn’t important but by making sure they will be directly across from each other, they can be used to support interior baffles that will prevent visitors from staring through the house and seeing that it’s an empty shell. The interior bracing and corner trim also make it easy to glue the side walls into place against the end walls: I simply add glue to the brace and press the side wall against it, tight against the corner trim, with everything set on my glass surface. Finally, note in the first photo in this post that it’s a good idea to number the adjacent corners of each wall before trimming away the interlocking tabs. Tabs tend to be keyed – they only fit the correct adjacent wall – but once they’re gone it can be easy to mix up the relationship. With numbers, one can match up the edges. 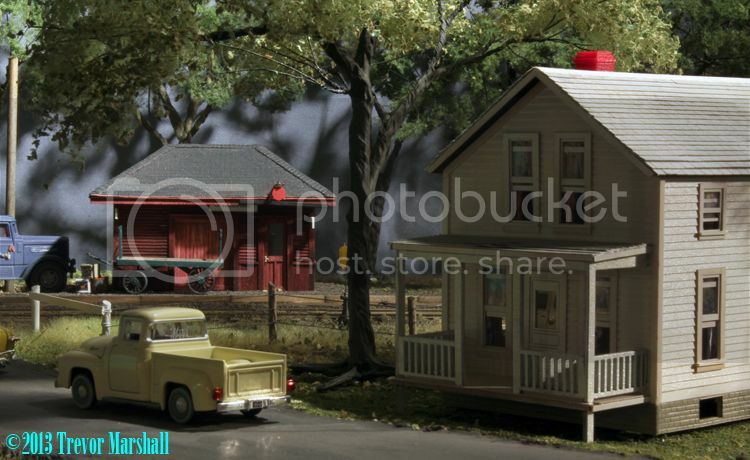 The sneak peek for the January, 2014 Railroad Model Craftsman notes that the issue includes a feature on Dawson Station by Kenneth Olsen. 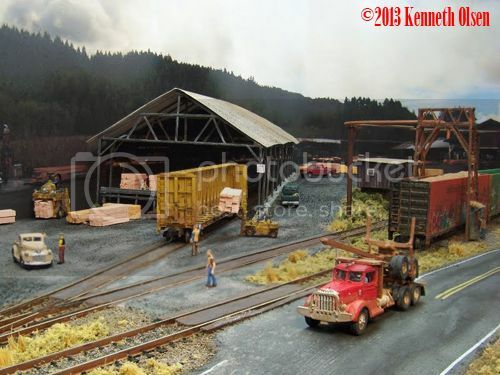 As the photo above shows, this is a very nicely done layout that’s based on a prototype sawmill in the northwestern United States. * the Eugene Maker’s Festival in March. To cite one example, this Toronto Star article from September reports on a Mini Maker Faire in the city where I live. Note that the reporter seems quite taken by the typewriter that prints out Twitter messages. The theme that runs through many of these articles is that these Maker Faires represent a return to doing things and learning craftsmanship skills such as soldering, metal working, wiring and so on. Of course, for model railway enthusiasts there’s no “return” involved, because for us such skills never went away. They’re part of what we do – mastering these skills and many others is essential to making the trains run. And for many – including myself – it’s an important reason why we do this hobby. 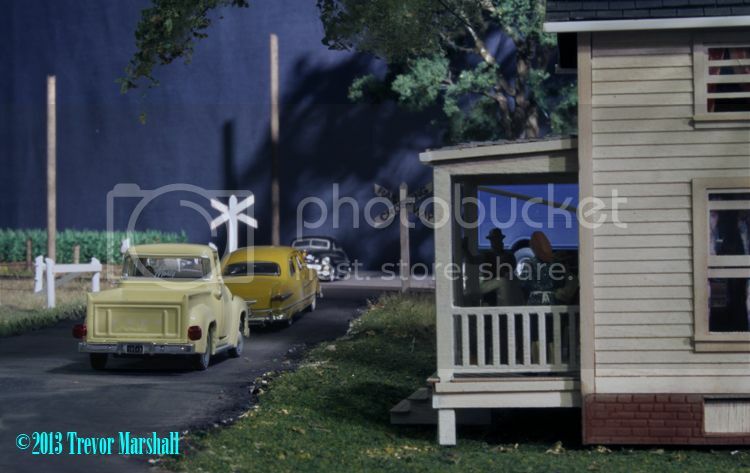 But when outsiders look at the model railroading hobby, they often see it differently. 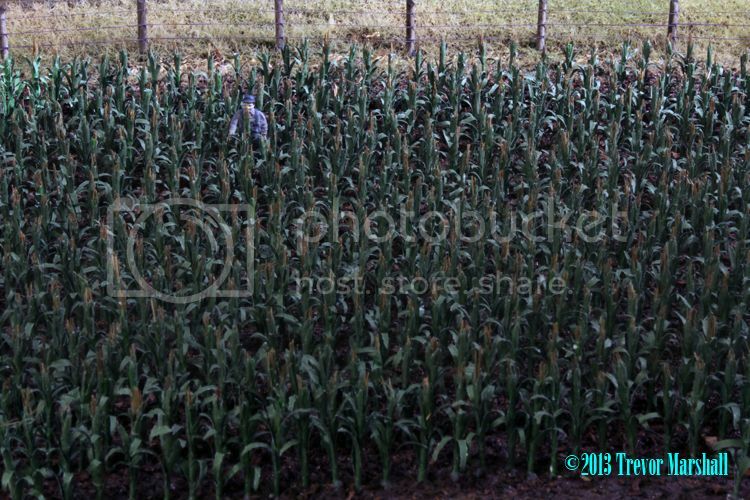 They see a bunch of people – mostly men, mostly caucasian, and increasingly old – playing with toys. And yet, there’s not much different between building a small layout and building a tweeting typewriter: both projects require learning a variety of skills and both are undertaken for fun. 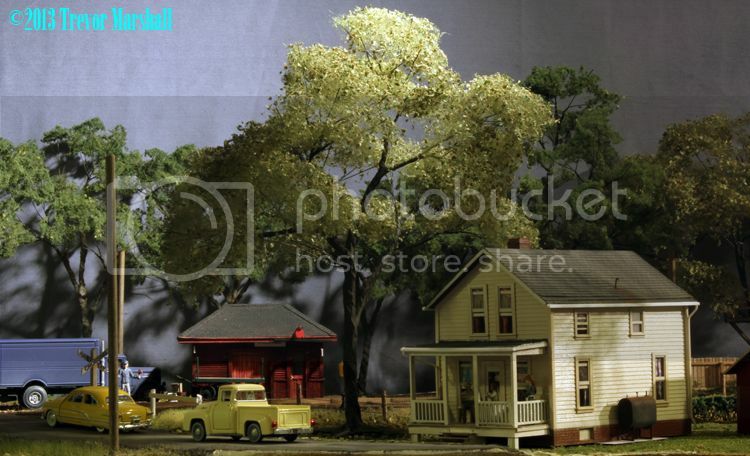 * He’s started with the best aspects of the model railroading hobby – including prototype research and the many craftsman skills that we learn when we build a layout. * Then he’s added a very modern dose of computing coolness, using Arduino open-source hardware and software to perform various tasks on the layout including occupancy detection, locomotive control, and switch control. 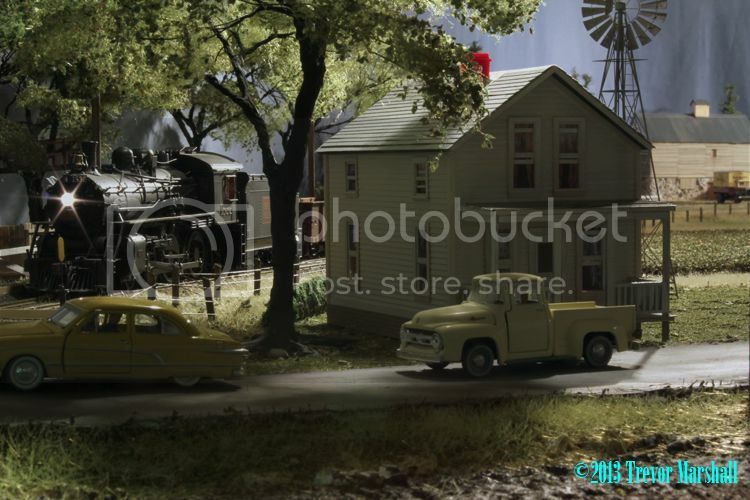 Incorporating Arduino into the layout makes the model railroading hobby relevant to the bright young people who are using the system to build robots and other Maker Faire staples. * And finally, Kenneth is taking his layout to the types of events that attract people who are interested in these types of skills. Those are people who could become life-long model railway enthusiasts – providing the hobby is shown to be relevant to them in some way. Another thought is to incorporate ways for spectators to interact with the layout through their own personal electronics and social media. This could be anything from harnessing Twitter to display messages on a billboard all the way up to using Wi-Fi and an app like WiThrottle to control the trains. My snow plow project has been delayed until I get my mitts on some sanding sealer. In the meantime, I’ve had a couple of quiet days so I’ve been able to start working on something else: The house for the St. Williams scene. 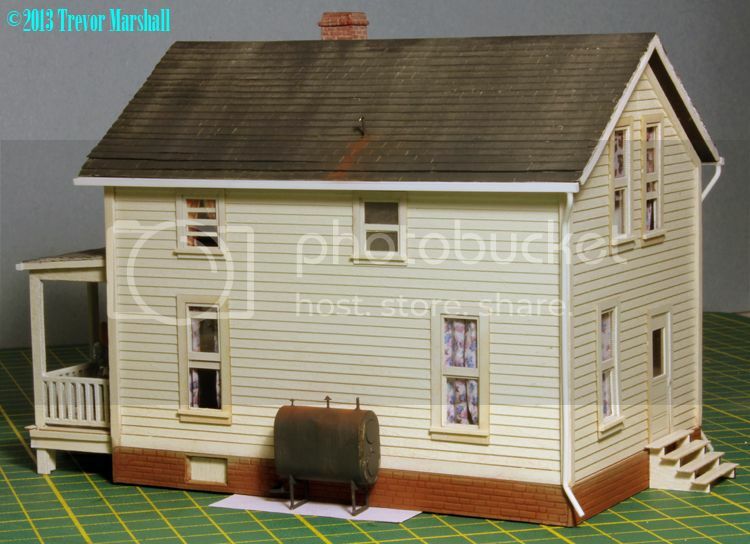 For this, I’m using an S scale kit from Branchline Trains – the Finley House. 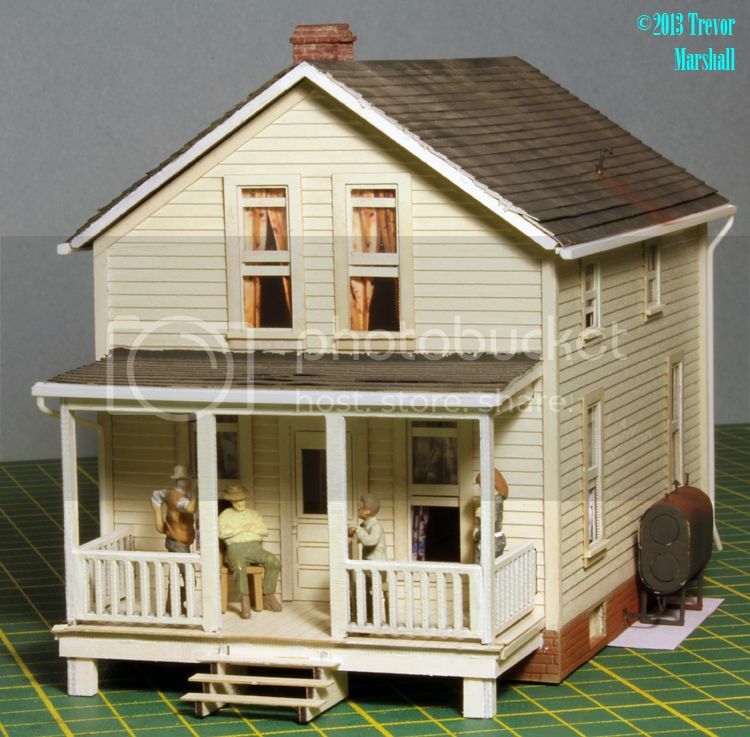 I like the manufacturer’s model in white, so I started by airbrushing a lacquer-based white on all the wood parts (except the two main roof panels, which I did with black). I used a lacquer-based paint to seal the wood without the warping that a water-based paint would cause. I was able to start construction the following day. I like laser-cut kits, but in general I don’t like the peel and stick trim. I can live with it for things like the frames around windows, but I can never get the corner trim to look nice. There’s always a dark line where the pieces don’t quite meet. So for this laser-cut kit I decided to do something about it. 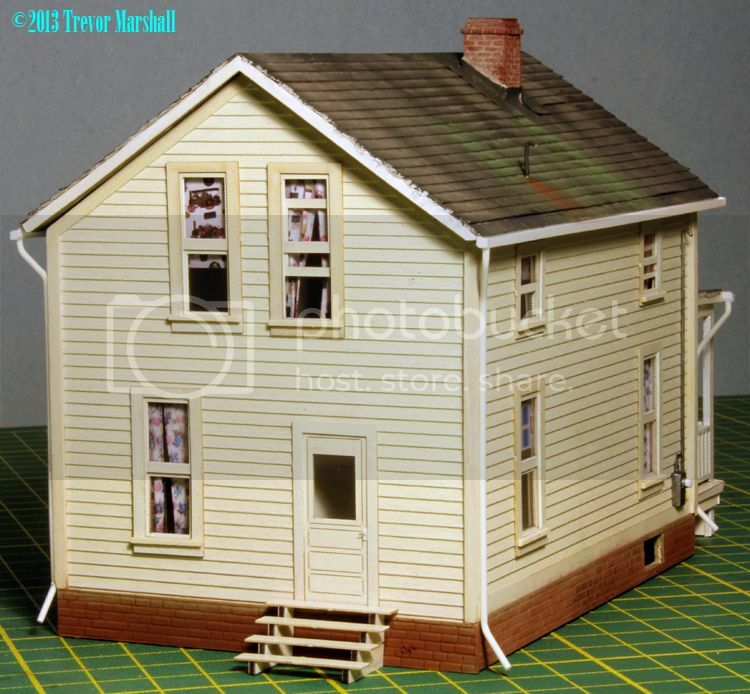 I borrowed a technique I learned for making corners while building many Campbell Scale Models craftsman kits in my formative years in the hobby. 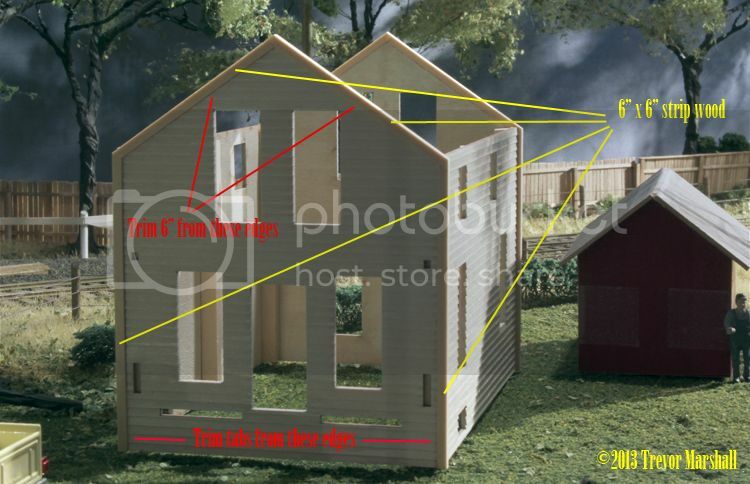 As it suggests, I cut the tabs off all four walls – including the edges that slot into the roof. On the roof edges, I also measured in six inches from the edge and trimmed back the end walls. This made space for 6″ x 6″ scale lumber to form the trim. I glued the square strip wood to the edges of the end walls, working on a piece of glass and making sure that the strip wood was lined up with the inside face of the wall. I added the vertical side pieces first, then trimmed them to the angle of the roof. I then added one trim board to the roof line, trimmed it, then added the second and trimmed it as well. Some light work with an emery board cleaned up my trimming. Next up: making all those windows and doors. I’ll tackle that as time allows – and will replace the kit’s clear acrylic window glazing with my own glazing cut from microscope slide cover glass. Stay tuned!